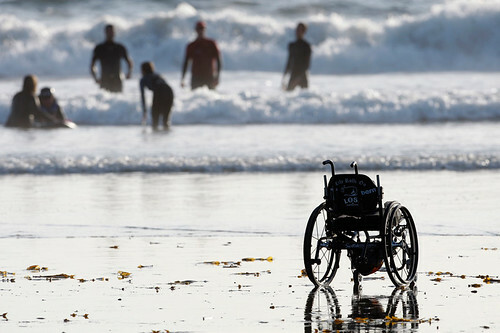 caption: An empty wheelchair belonging to quadriplegic Patrick Ivison, 15, sits idle on the beach while Ivison, his mother, and friends prepare for another surf ride at the Cardiff State Beach in San Diego, California on October 6th, 2009. The photo has the focus on the empty chair at the edge of the beach, with people in the waves, some standing, one on a board. The people are out of focus so you can’t see anyone distinctly. There is scattered seaweed in the wet sand. […] i guess i am saying that there’s a limit to how actually subversive a blonde skinny white pop star can be. that isn’t a reflection on gaga (or any other blonde skinny white pop star) herself at all – it’s a reflection on a culture that marks some bodies as acceptable and some bodies as inescapably transgressive. for gaga, the grotesque is a costume, an act. ACT Disability Minister Joy Burch has been grilled over the treatment of disabled people who are stuck in hospital while the department tries to provide supported accommodation. The ACT Liberals have used an Assembly committee hearing to highlight the case of one woman who has been in a Canberra Hospital bed for nearly three years. The Taoiseach Brian Cowen has rejected opposition calls for the budget cuts on the blind, the disabled and carers to be reversed. Mr Cowen said the Government has to create a sustainable social welfare system next year.